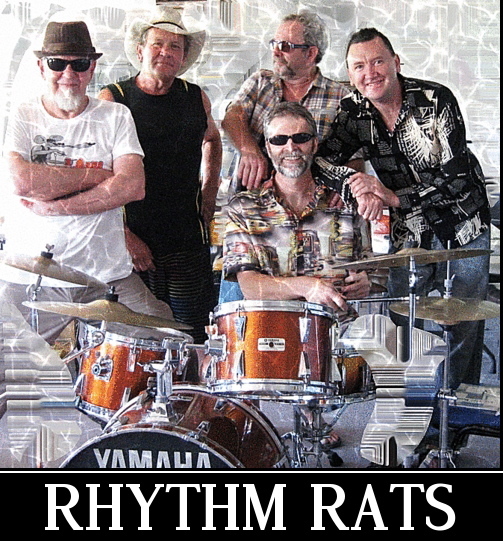 The Rhythm Rats (2012) are - John Gratton, (Lead Guitar/Acoustic Guitar / Vocals). Gary "Buffalo" Melbourne (vocals / harmonica). "Rolly" Dwyer (drums). Terry Wilcox (bass). "Jack" Melbourne (guitar/ dobro slide/ banjo/vocals). Playing a mix of rootsy rock n roll, rhythm & blues. country-blues . The RhythmRats were also involved in several Theatre productions (during this period) by the critically acclaimed "Murray River Performing Group" (Now the Hothouse Theatre) working with well known national actors/comedians e.g.- Sally Upton, Denise Scott, John Walker. The band then went on the road as featured artists and backing band with The Ray Kernaghan country road show , featuring his son the now famous Lee after several tours and appearances at the Tamworth country festival the "Rats" went back to their roots with a highly successful hard rock show performing at B&S balls, festivals, competing with top national bands on the pub rock circuit the last lineup toured N.S.W / Victoria and a highly successful four week tour of Tasmania. Moves were made in 2010 to reform the band after 20 years and with a RhythmRats track (Trigger) getting internet exposure on a New York radio station the Rats have settled on the hottest lineup they have had for many years. The latest five piece lineup includes new member "Jack" Melbourne (ex FarGone Beauties-Sydney) adding to the bands unique blend of instruments and giving us more options as a roots based rock band. it's own unique sound blending Electric guitars with Dobro slide, Banjo, Harmonica & harmonies . Tom Petty and the Heart Breakers. Commander Cody and the Lost Planet Airmen. Huey Lewis and the News.